The tyres which have been sitting on the B for the past year or so are around 20 years old. Although the treads are still very good, almost like new, the rubber has perished somewhat (it's recommended you change tyres at least every six or so years) and could result in a blow-out. Before I do any more driving they need to be changed, else I'd be likely to find myself facing the wrong way down a B-road. 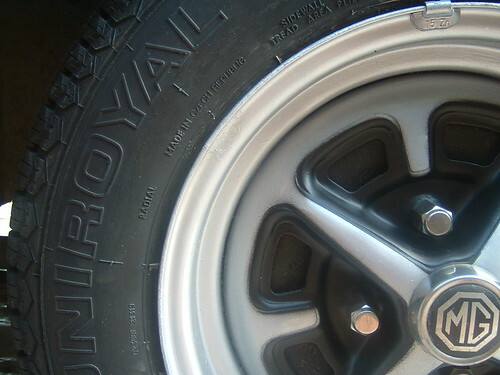 The original tyre size is 165/80-14 which are in short supply these days, mainly being used for small vans, but there are a few options including what I eventually went for, the Uniroyal Rallye 380. A lot of B owners go for a slightly wider tyre such a a 175 or 185, but what these give you in road-holding they take back in heavier steering at low speeds - especially if you decide to fit a smaller steering wheel at some point. Another disadvantage of wider tyres is possible wheel-rub on the rear arches when cornering, due to the slight offset of the rear axle. With all this in mind and a check on the MGOC forum that the standard 165s would perform for what I wanted, I decided on a straight replacement. Once you've decided on your tyre size, you also need to find somewhere which will balance them correctly. Normally wheels are balanced using the centre hole, sitting it over a cone on the machine. However, Rostyle wheels have a non-concentric centre hole. This means that if you try to balance it on that you'll end up with a lot of wobble. You need to find somewhere with an adapter for the balancing machine - ask for one which will balance solid-centre wheels (again normally for vans) - it's likely you'll need to do a bit of calling around and unlikely the usual high street chains will know what you're talking about. Luckily after four or five calls I came across North Eastern Tyres, a great outfit with friendly staff and some fantastic prices. A few hours later I had a set of new tyres all balanced and tracked and finally a steering wheel in line with the front wheels.